We deal in all types of large commercial project works. Our strength is our personnel; they are among the most experienced and professional trade’s men in India. 1. Installation, Testing and commissioning of D.G. sets. Transformer servicing, Filtration and oil testing. 2. Erection, Testing and commissioning of 11 KV to 33 KV Sub-Stations and their controls, HV & LV switch gears and their controls. 1. Maintenance and troubleshooting of the various electrical & Industrial electronic equipment. 2. Pre-commissioning and post commissioning service of electrical and Industrial electronic equipment maintenance. 3. 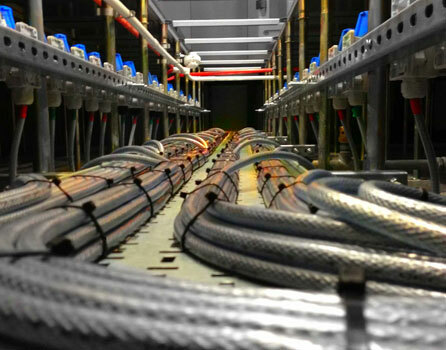 HT, LT, Cable laying, Termination, Cable Joining, High pot testing of cables. 4. Trouble shooting of HT & LT Motors. 1. Industrial type Power distribution Boards, Power Controls centers, Motor control Centers up to customers requirement. 2. Preparation of drawings, consultancy, liaison with Electrical Inspectorate & Obtaining statutory, approvals & execution of works for various Industrial electrification projects according to the customer requirement of medium scale industries. 1.Electrical Audit of the various plants to update systems as per I.E. Rules. 3. Domestic & Industrial all type of Wirings.